Is the $9 billion supplemental education industry doing enough? Indian Americans major consumers of after-school coaching. NEW YORK: In the late nineties, a tech specialist and mom, Mridula Gupta, was taken aback at the persuasive suggestions from her daughter’s teacher at a prominent private school, in New Delhi, to have her enrolled for private tuitions to enable better performance. Gupta wondered how her seven-year-old daughter could ever get to have a normal childhood, if life after school meant rushing between tuition classes for various subjects that ran late into evenings. 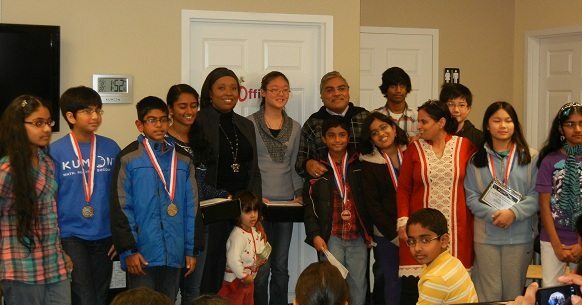 An award ceremony at a Kumon center. Years later, when she started a new life with her family in the United States, Gupta surmised the flexible curriculum of schools here would be a welcome escape from the pedagogy of Indian schools that pivoted around pages of endless memorization. However, as the years passed, she was puzzled, and then resigned to the fact that at any given gathering, conversations inevitably devolved into talk of tutorials and extra curriculum activities that children were sent to after school hours. It left her wondering whether she had missed something by being perfectly content with the easy approach of public schools in the US, or was it the other parents’ grating will to succeed at all costs that drove them in such large numbers into extra-curricular academic centers. “The drive is somehow to make your kids smarter than someone else. It is not enough that they should get a 2000 in their SAT or even be a national scholar. It is all about getting into Ivy League schools, about being a science or math genius and always in reference to some other level of success,” says Gupta. A research study, Young Children Learn through Early Authentic Play through Nature Explore Classroom, by Dana L. Miller, observes that playing in the mud, swing sets and tree houses helped define happiness for children which served as an important component to their development. It shaped the potential to become future leaders as they enacted different roles. These time-tested methods were previously surveyed extensively by Maria Montessori who devoted her entire life to the study of human behavior. She wrote: “Our aim, therefore, is not merely to make the children understand, and still less to force them to memorize, but so to touch their imagination as to enthuse them to their inmost core.” She believed in compiling stories that would introduce “truths of the universe” to the children. “Let us give them a vision of the whole universe,” she proposed. In this context it is only prudent to point out that while intellectual achievements are impressive to adults, what is crucial to the growth of personality is the development of social behavior which rests on good behavior, empathy with one another and the ability to sort out difficulties. Speak to any child attending any US school, and, undoubtedly, he or she will tell you that social pressures far exceed academic stress, with peer rejection taking a heavy toll on them. However, in recent decades, the culture of modern life has drastically cut into down time for children and teenagers. The reasons are manifold: harried pace of households with both parents working, the mandate to build a college resume from a young age, the effect of No Child Left Behind (NCLB) that has led to augmented emphasis on reading and writing, and lastly, an exaggerated dependency on technology to educate and entertain children. Consequently, the spectrum of education in the US has vastly changed from what it earlier stood for. There has been a surge of academic tutorial centers across America. Walk into a shopping plaza and it will inevitably be dotted with a Kumon, Huntington, or Sylvan learning hubs, to name a few. These for-profit providers recruit tutors using their own means, and are not necessarily linked with school districts or government programs. Similarly, with the implementation of NLCB, school districts are now required to provide supplemental educational services (SES) to kids who do not meet academic requirements. The purpose of these is to raise proficiency levels in state level testing. The options are not limited to only the for-profit and government-sponsored services to help children keep up with their peers and even exceed them, in academic spheres, and hone social and artistic skills in stress-free environment outside classrooms. On a different spectrum lies Khan Academy, a non-profit academic organization which is funded entirely by donations. Revolutionizing education for future generations around the world through YouTube videos and free downloads and other visual aids, it has garnered national recognition and praise from Bill Gates, The Colbert Show and 60 Minutes. It capitalizes on the principal of education for free by transfiguring the way it is channelized through individualized learning and tracking methods while covering a vast spectrum of subjects from mathematics, history, medicine, biology to a host of languages. Competing for a share of the $9 billion addressable supplemental education market, which is becoming increasingly crowded, is also cutting edge, hi-tech online tutorial services like Tabtor Math, which has developed apps for the iPad and the Android. Suneja declares that this classroom free technology is the path to future e-learning tools. With a highly competitive market revolving around supplemental tutoring, that continues to grow because of burgeoning demand, the question that begs to be asked is: are popular centers like Kaplan or Sylvan, which are listed as billion dollar industries by Forbes, only money-churning industries? Well, not exactly. Take for instance the example of Dhawal Bhatnagar of New Brunswick, New Jersey. He was diagnosed with learning disability problems by the school counselors, much to the disappointment of his parents. His dad, who did not have a university degree, was initially at a loss. He steadfastly refused to be a victim of a passive diagnosis. “I put him into private coaching with the Huntington Center which provided him with close personal attention. Gradually with the help of his guidance counselors and his own initiatives, he is now a well-adjusted ninth grader, at par with the rest of his classmates. Although he may not be among the top few, he is happy to be placed in the regular classes,” his father said. Experiences such as these are further confirmed by Dotty Josh, who runs The Tutoring Center in Wilton, Connecticut. “Through a diagnostic assessment of children with the help of trained and seasoned instructors we try to figure out which areas of learning need special focus. The method of Rotational Approach to Learning along with a careful handling of students in an environment, free of competition and no homework, we help these kids to achieve better grades. For example, students who have been put on medications and are diagnosed with Attention Deficit Hyperactivity Disorders have vastly improved when they went through our sessions. In time they were even able to stop medications,” she said. The center caters to every kind of child regardless of the level of achievement in school. Typically, academic success for many shy kids is frequently diminished in a class room setting where there is high degree of competition and the fear of ridicule runs rife. Those who are verbal with strong reasoning skills are the ones who draw the teacher’s attention while many others suffer through a humiliating silence. This is remarkably true for Indian American students who may be struggling additionally with pressures to adjust to an external culture and may even be ashamed to own up to it. Likewise, the institutional nature of schools can induce a fear for math and science whereas classroom sizes in tutorials tend to be small and less forbidding. A sense that kids are not being challenged enough by the school system prompted Shanthi Umashankar to send her seven-year-old boys to Kumon. “The lessons trained them to do mental math quicker. The only drawback in Kumon is that it sometimes gets boring for the kids, since it’s repetitive. But, with more repetition, they get more accurate and fast,” says Umashankar. The requests for assistance with study skills and SAT Prep have increased in the last few decades, states Robin Hinmon, of Brandywine Academic Services in Delaware, who has been a teacher and an independent tutor for 20 years. “Students lack the ability to organize their notebook, manage deadlines for comprehensive assignments, take valuable notes from their textbook, or even study effectively for a math test. Yes, we want our students to graduate with a solid understanding of the material, but we need them to be equipped with essential study skills that will eventually evolve into important life skills,” says Hinmon. Both Hinmon and Jindal testify to the fact that more than half of their student population is of Asian origin, many consisting of Indian origin students. This is hardly surprising given the traditional record of the Indian American community being education-centric about raising kids. The memory of drill, practice and exercise as designed by schools in India, from the time children are three to four years old, carry on as a hang- over when Indians move to the US. It is also based on a culturally accepted norm that adults know best and children need to be receptive and obedient in mind. Continuing with that tradition, Ram Jayakrishnan put his daughters to Kumon when they were three and a half years old. He and his wife were both engineers with a rigid 9 to 5 job schedule. “Exhausted by the time we returned home and with dinner to prepare, we thought it best to put them at a learning center rather than a day care,” says Jayakrishnan. The girls are now eight and twelve and maintain a tight schedule, ranging from Bharatnatyam over weekdays, Math and Science lessons on Saturdays and Hindi class on Sundays. This classic syndrome of modern culture where both parents work office jobs, is a necessary fall-out of the work place uncertainty. However, this inclination is no doubt hurting children as more and more parents are spending less time at home and the task of nurturing the child is transferred to outsiders. Nalini Venkateswaran is a Carnatic music teacher in Pennsylvania who is also actively involved with a Hindu Temple in Delaware. She feels appalled by the pressures Indian parents impose on their little ones. None of her three children have sought tutorial help, and have flourished with the help she provided at home. Noting the prevalent trends, she illustrates the examples of six and seven-year-olds who are put into her music classes, although some may have no visible talent. “I tell the parents to give their kids a break as they are so exhausted with classes lined up from sports to dance to karate. But they refuse to listen, insisting it is required for their college resume. When the kids are young, they need to relax and enjoy their childhood but parents want to live their dreams through them,” says Venkateswaran. She recollected the case of a teenage girl who had fractured her leg three times while doing karate but was nevertheless pressed on by her mom to go on with the sessions. Somehow doing nothing is not encouraged by our boot camp society of “Tiger Mom”. But it would do well to acknowledge how precious leisure is to children as they need that gestation time to absorb ideas and reflect upon them. “Even if my parents are fine with my studying Literature or Philosophy, their friends keep voicing their concern about my lack of interest in technology. This narrow-minded attitude needs to be changed,” said Renuka Mathur, a college student at Penn State. Time and again, research has shown that such emotional abuse that may lie suppressed in childhood may manifest into serious problems in youth. Shekhar Nandy was a straight A student in school. However while studying at John Hopkins University, his grades dropped and he felt unable to confide to his parents who were exceedingly ambitious of him. Additionally, the issue involved a loss of considerable money if he transferred to another school. Suffering from depression and anxiety, he dropped out of college without informing his family. Years later after stumbling through different courses, he eventually joined a Community college. His parents were lucky; there have been several instances of suicides among college undergraduates, precisely for the same reasons. This is not to disparage the commendable assets of industrious and striving students but to draw a fine line between individual autonomy and parental expectations. “Education needs to be individualized and not in comparison with how others stand,” recommends Mike Salladino, a guidance counselor at a high school in Pennsylvania, who says SAT or ACT preparation could require outside tutoring as it dealt with a specialized format. “It would save needless worry and self- defeating apprehension if we humbly conceded that students do best when their vocations are self-chosen and founded on personal interest. Success lies in responding to the inner genius in every child,” says Salladino. When the pressure piles up, “the effects are disastrous with children becoming nervous wrecks,” he adds. Salladino noted that the trend was particularly true for the Indian American community. “I see this all the time with parents demanding their kids to be put into the Advanced Level Courses even when they are unable to handle the stress. Usually it starts with a sense of competition with neighbors and translates on to the children. There are millions of quality schools in the US, but each year we see a rise in applications to Ivy Leagues despite their exorbitant tuitions. Again, the kids have to cope with peer pressure as they may not fare as well as their friends in a high level class,” he said. (Note: some names in this story have been changed and their location not mentioned, to protect the identity of those interviewed, at their request).